Living a quilting life, one stitch at a time. I had a woman at the last craft show ask me about adult bibs. I have made them before – for my friend Pam who sadly has passed and for my mom. The well-endowed ladies like them to protect their blouses while dining. They were especially cute with lobsters on them, or spaghetti. This lady wanted them for her dad for a very practical use. He is handicapped and needs a little help at mealtime. 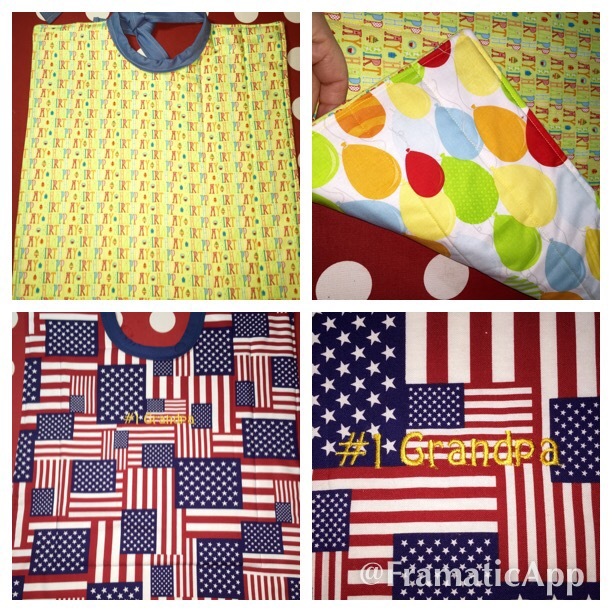 Her adorable daughters picked fabric, one celebrating his birthday with balloons and the other celebrating his being a veteran with American flags and an embroidered inscription, “#1 grandpa”. These were super-easy to make. 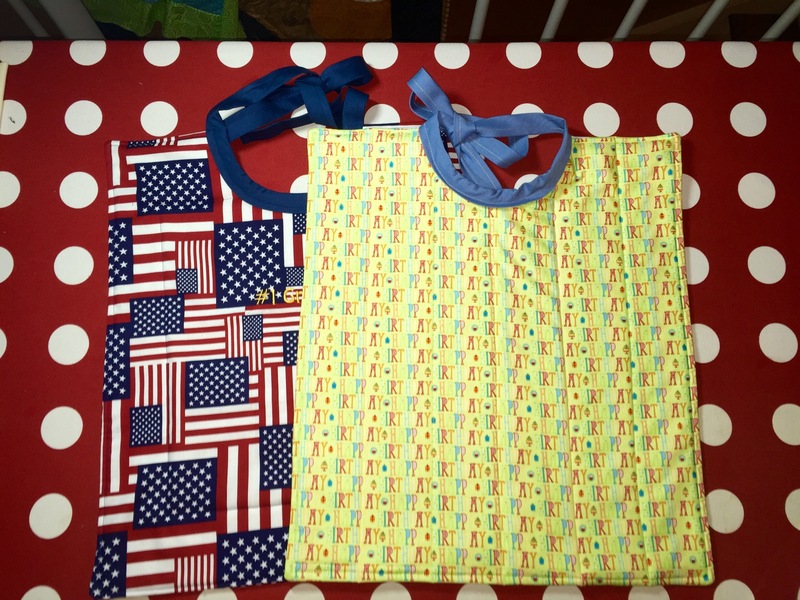 I cut two pieces of fabric, 16″ wide by 18″ high, one each for the front and back. Later a piece of batting with the backing right side up on top of it and then the front fabric right side down on top of the back. See around the perimeter with a 1/4 inch seam, leaving an opening to turn it inside out where the neck will go. Then I used a jar to trace a half circle and used double fold bias tape to finish the raw edge and create ties. Quilt as desired and you are done. This is a quick project that you can have fun with. Enjoy! Visit me at my next Craft Fair! Visit me at the popular Ridgewood NJ Craft Show and Street Fair for a selection of seasonal handmade quilts, embroidery, gifts and home decor items.